I’m leaving for World Horror Con in New Orleans, tomorrow. I’m going with part of my writer’s group and I’ve been hopeful about it for quite a while. It’s my first World Horror. And in NOLA! Woo! On the other hand, I’ve been exceptionally sad for the last few months and I don’t know if I have the internal fortitude that I need. I want to be with people who love me, not strangers. It’s my daughter’s second birthday, and I’ll miss it. Miss the party, miss the snuggles and celebration. And I’ll miss having somebody to cry with. For those of you who don’t know, I was carrying triplets and we lost two. Daisy before birth, and Seija after. It has been two years since I watched one of my little girls die. I’ve been dreading this anniversary with everything I have. Grief is a funny thing. Some days we manage quite beautifully, and others…I thought it would be easier by now. That life would be easier. It isn’t. There are good days and bad days. But everybody expects a few months of grief and then complete healing, including me. And life doesn’t stop to let you grieve, either. I’ve been walking around with a gigantic Fragile: Handle With Care sticker for a while, but there are still bumps and bruises that just come along. That’s life, yes? 🙂 We all know it. We all live it. I live in Las Vegas, in the middle of the city. 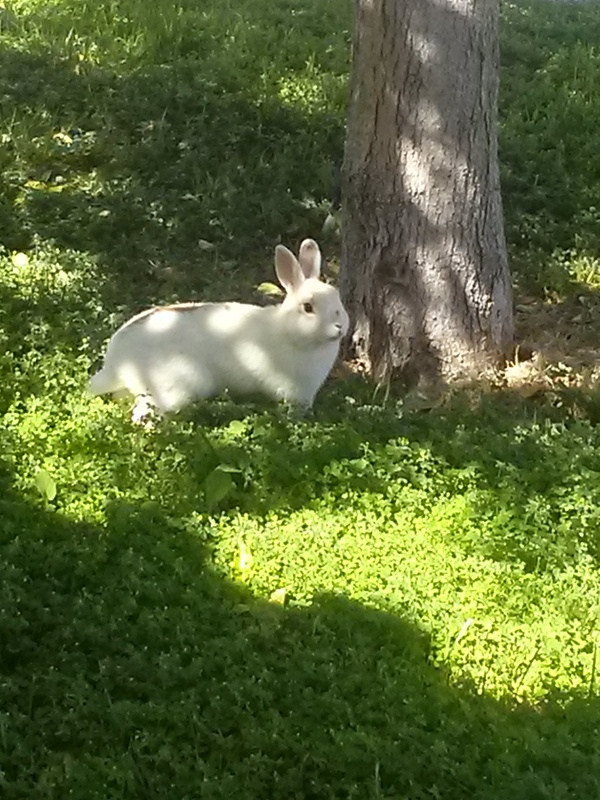 Three days ago, a white bunny appeared on my front lawn. It was the most breathtaking, magical thing. A thing of true beauty. White and sweet and somewhere that she completely shouldn’t be. I saw her twice that day. 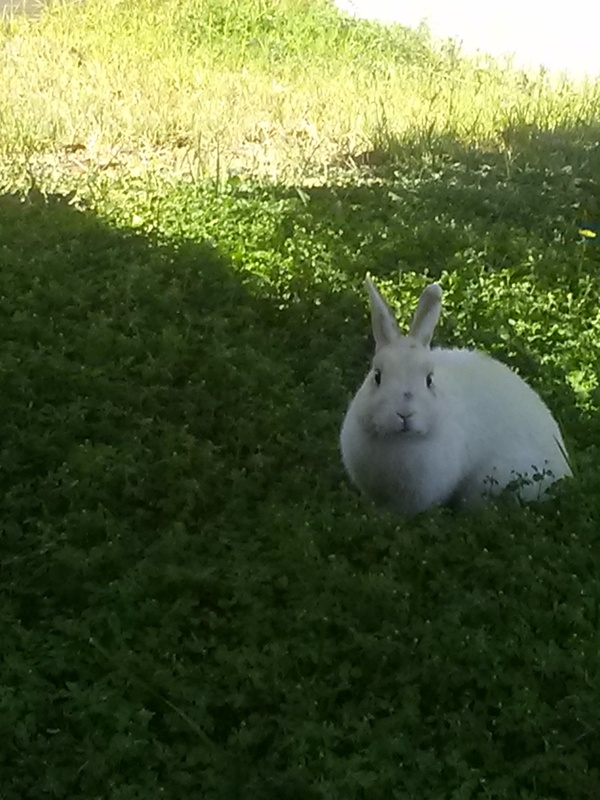 Later that night, while folding laundry and watching true crime (as I am wont to do) a white bunny factored into the crime case. That was three white bunnies in one day. I can’t tell you what that meant to me. It seemed like an omen of hope. Of good things. It filled my heart. I saw her again, yesterday. Twice. She’s here again today. That’s three days of hopeful white bunnies. But this? I choose to think yes. That Omen (which is what I named her) showed up to give me hope. The joy that she gave my children was indescribable. Mom! 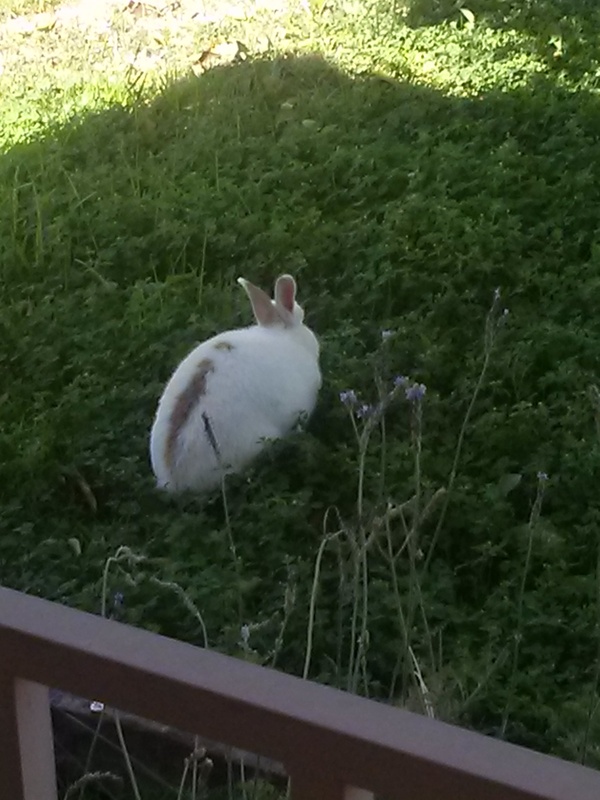 A bunny! At our house! I think it’s magic! I’m ready to reboot. Head out to this conference and focus on writing for a while. Friends. Enjoy the city. Become inspired. Saturday, their birthday, the day I’m most afraid of, is full from top to bottom. I’m reading from Beautiful Sorrows. Doing a panel. Going to a Kaffeeklatsch with Ellen Datlow. Running pitches for two hours. Going to the Bram Stoker Awards banquet. And I’m wearing a really darling little dress that I bought because it just looked so happy. I’ll try my hardest to make it A Day of Happy. If you’re there, won’t you join me? I happened to have a dream last night in which that thing called sorrow — and the question of whether it ever gets easier — surfaced. So ironic to stumble on your post today via Twitter. Wishing you well as you reboot. I’ve been following your posts re: the white bunnies on Facebook. Much to charming to ignore. You are never alone–we all go through it, some earlier than others, some worse than others. It doesn’t make any of it easier–I found writing to be my #1 outlet–looks like you use it too. Wishing you lots of strength on the upcoming birthday. Dearest! I will be with you and Love You to the best of my ability. You are an inspiration, but not only because you are strong, but from all the ways you show the world your vulnerability. That sharing and openness speaks. Thank you for being you. I have had butterflies, flowers, all sorts of things show up when I needed a little comfort. I’ve heard them called “tender mercies.” 😉 Your white bunny is magical — hope you had a great weekend! This is a beautiful post that really hit home for me today. I’m struggling recently with Father’s Day and the 5th anniversary of my dad’s death — always back-to-back. Grief is indeed a funny thing, and something I feel I have much less control over than I’d like. Anyway, lovely post. Hope you had a good time at WHC; I’m super jealous you got to go! Thank you so much, everybody. This rabbit has brought me so much joy. I needed her. Annie, I’m so sorry for your loss. I can only imagine how difficult Father’s Day is. Mother’s Day about did me in. There’s a beautiful poem I read in college about grief. That it’s like a big, bulky box. Sometimes you hold it awkwardly. Sometimes it’s fairly comfortable. But you’re always carrying it, never putting it down, and you have to shift it around from time to time. I wish I could find it. I find it to be an apt description.